Ingersoll was a brilliant man and a rousing orator, but he wasn’t always ahead of his time. 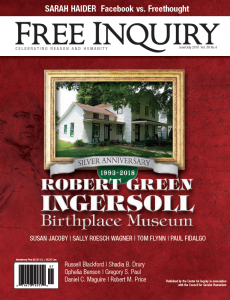 Almost alone among Golden Age freethinkers, Ingersoll’s ideas about women would not seem out of place today. The story of an epic battle between freethought and censorship. The Council’s Freethought Trail has a new look and new features. There is no deus ex machina. The battle against climate change is on us. OK, so Christianity is untrue. But what if it were made “true”? Five U.S. presidents whose grasp of church-state separation was exemplary. Christian theology’s new champions have achieved far less than their admirers may think. Radical-reform history is obscure largely because religious conservatives want it that way. Far from freeing us, social media has made many more cautious about speaking their minds. A Step Closer to Human Cloning? The recent cloning of macaque monkeys is impressive, but we’re still a long way from human reproductive cloning. The cyclical view of history is not just a testament to human folly but to human limitations. Trump’s inability to grasp the reality of other minds is so extreme it amounts to a handicap. There is no biological necessity for predators; a good God could have (and should have!) arranged the world differently. The West now is firmly in the Secular Era, when supernatural religion fades to a discredited fringe. A dissenting view from Greta Christina’s on rationalist dogma. The afterlife is comforting but a myth; those who know the truth learn to make do with less ambitious consolations. Humanae Vitae, one of the greatest mistakes of the twentieth century, turns fifty. Infinity may be real, and Zeno’s Paradox may not rebut it. I cannot be a part of worshipping a god with strong psychopathic traits. How to ensure, if asked to proffer a prayer, that one will never be so asked again.